Habaki : Gold foiled bouble Habaki. Blade length :　61.6　cm or 24.25 inches. Width at the hamachi : 2.96 cm or 1.16 inches. Era : Late Edo period, around Kaei era 1852. 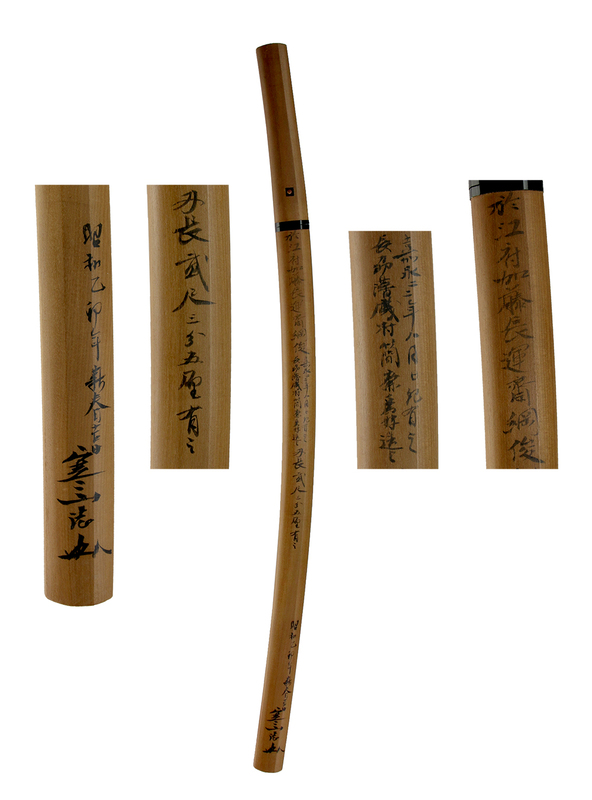 Shape : Short Katana, regular width and thickness with large Sori. Hamon : Nie Deki, Choji Midare. The Hamon of Boshi is Midarekomu. 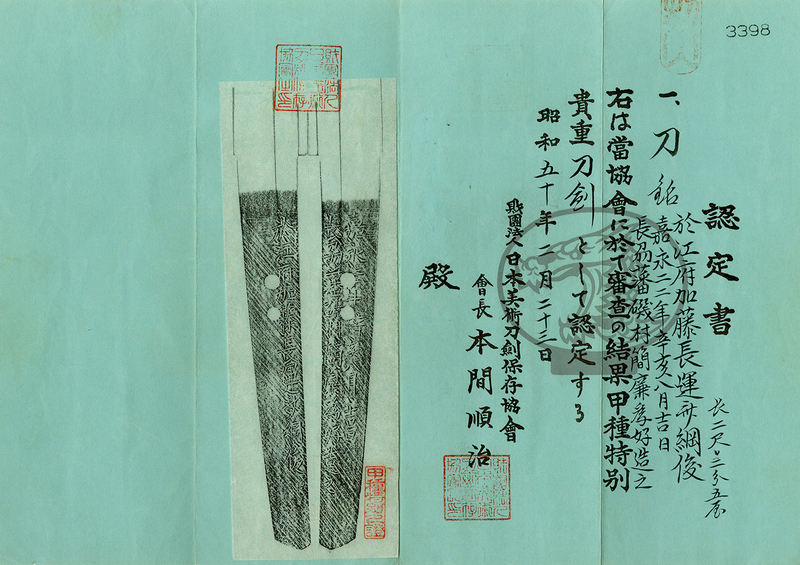 Special feature:Chounsai Tsunatoshi the First forged this katana at Edo in 1846.
he lived a house of the Uesugi family at Azabu in Edo. Tsuba : Round shape, iron Tsuba, some design is engraved. Menuki : Coper, horse is engraved with silver color. Fuchi: Shakudo Nanako, butterfly is engraved with gold and copper color. From Aoi Art: The Ubu-Ba left. The blade is healthy. Probably this blade was made for the battle. So the blade is rather short. But the width and thickness is nice. The Jigane is beautiful. The Hamon is typical Tsunatoshi’s one. 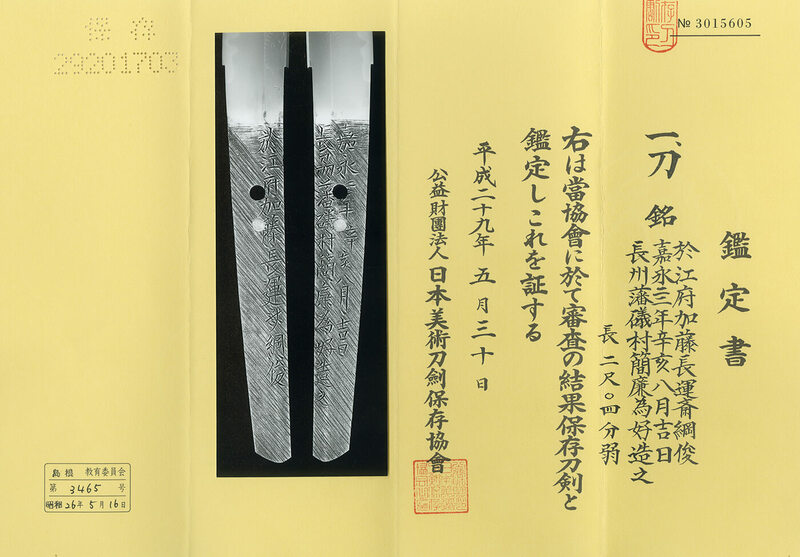 The Gunome Midare and Choji Midare are characteristics. The blade was made for Mr. Isomura Fumikado of Choshu Domain. We recommend this blade very much.